Results from the DIAMOND study of Symtuza (darunavir 800 mg, cobicistat 150 mg, emtricitabine 200 mg, and tenofovir alafenamide 10 mg) indicated that at 48 weeks, 84% of participants with HIV achieved undetectable viral loads in an intent-to-treat analysis. In an observed analysis, which excluded patients with missing data, 96% achieved undetectable viral loads. The study enrolled participants who were able to rapidly initiate treatment with the single tablet regimen (STR) Symtuza within 14 days of receiving a diagnosis of HIV infection, before lab or baseline resistance test results are at hand. "Rapid initiation of antiretroviral treatment is becoming the recognized standard of care for newly diagnosed HIV-1 patients, as it has the potential to improve treatment outcomes, including the probability of a person adhering to treatment and staying in care, and could be an additional strategy in our quest to achieve the 90/90/90 prevention and treatment goals as outlined by UNAIDS," said Moti Ramgopal, MD, Infectious Disease Director, Midway Immunology and Research Center, Fort Pierce, Florida, who has received research support from Janssen and has served as a paid consultant. 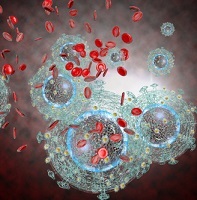 The single-arm, open-label phase 3 study evaluated the efficacy and safety of rapidly initiating Symtuza in 109 adult patients with HIV infection. Of those, 89% (n = 97) completed the 48 weeks of daily Symtuza treatment. At 48 weeks, an intent-to-treat analysis revealed that 84% (n = 92) achieved undetectable viral loads of <50 c/mL and 8% (n = 9) had virologic failure. The observed analysis showed that 96% (92/96) of patients achieved undetectable viral loads. Additionally, 100% of patients reached viral loads <200 c/mL at 48 weeks. The treatment was well-tolerated, and the study reported no serious treatment-related adverse events. The most common adverse events (>2%) were diarrhea, nausea, rash, vomiting, and fatigue. One participant discontinued due to adverse events. The trial also collected patient-reported outcomes with a validated HIV Treatment Satisfaction Questionnaire. Average patient satisfaction scores ranged from 56 to 58 on the 60-point scale and 97% of participants indicated satisfaction with their Symtuza treatment. "The DIAMOND study mirrors real clinical scenarios that physicians face today—including the need to start treatment before lab or baseline resistance test results are available—and highlights the benefits this model of care can bring to those newly diagnosed with HIV,” said Richard Nettles, MD, Vice President, Medical Affairs, Janssen Infectious Diseases, Janssen Scientific Affairs, LLC. Interim results from week 24 of the Diamond study were previously presented at the 22nd International AIDS Conference in Amsterdam. At week 24, 81% of study participants (88/109) had achieved undetectable viral loads of <50 c/mL, and 87% (95/109) had reached viral loads of <200 c/mL. Symtuza was approved by the US Food and Drug Administration (FDA) in July 2018 for the treatment of HIV infection in adults with no prior history of antiretroviral treatment or who are virologically suppressed for at least 6 months and have no known resistance to darunavir or tenofovir. The label includes a boxed warning about reports of severe acute exacerbations of hepatitis B in patients coinfected with HIV and HBV who discontinue treatment with drugs containing emtricitabine and/or tenofovir disoproxil fumarate.